I often find myself thinking about the great men and women of faith we see in the Bible. Their boldness, courage, fearlessness and tenacity to pursue after what God had laid out for them. I often compare myself to these individuals. Maybe you’ve done the same. I wish I was that bold and faithful, I tell myself. I wish I trusted God as unabashedly as they did. It’s really easy for me to compare myself to those who have done things I yearn to do. Not only within the words of the Bible but also in day-to-day life. But what I have to constantly remind myself of is the fact that these people were not perfect, and what I may perceive as a perfect and flawless life of faith and trust in God isn’t actually the case. They were human just like you and me. They made mistakes. They fell short. And they sometimes even chose the wrong. I’ve learned that your faith doesn’t always have to be perfect to be faith. In fact, it never will be and the Bible tells us that to be true (Ecclesiastes 7:20). These are all people in the Bible who did incredible things, had incredible faith, but also had some incredibly deep imperfections. I say this not to expose their flaws to feel better about my own, but to remind myself that we’re all flawed and a little messy. There is no such thing as perfect faith, and that’s something that should unite Christians around the world instead of divide us. We’re all perfectly imperfect, journeying through this thing called faith together, one mistake and one victory at a time. If this wasn’t the case then we wouldn’t have needed a perfect Savior, Jesus, to die on a cross and pay the penalty for our personal sins. So no matter what you’ve got going on in life. Whether your faith is as strong as it’s ever been or as empty as it’s ever felt, know that God is still God and his love for you stays the same. We all go through ups and downs in life. We all have highs and lows as it pertains to our relationship with Jesus. We all make mistakes. Don’t give up because you’re feeling down. God hasn’t given up on you yet, so neither should you. Try to keep your head up high even through the lows in life. Try to keep your eyes open to God’s goodness even when you feel like all you want to do is close them. Keep your heart surrendered even when you feel like closing it off to the world. 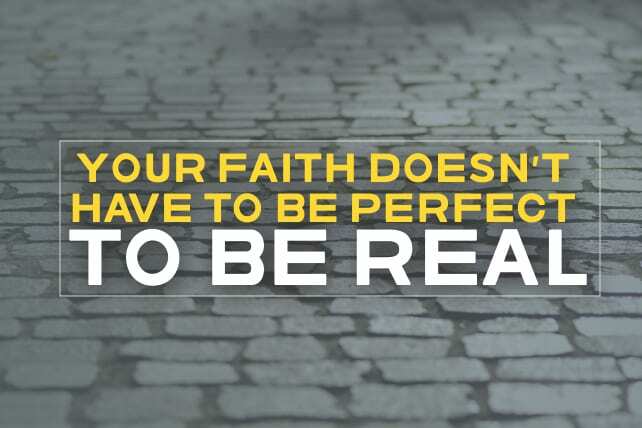 Your faith doesn’t have to be perfect to be real faith. Next articleThere Are Souls to Be Saved: How Can We Rest?